Below are 2 recent projects that Ocean Controls has participated in. If you have a project that requires technical expertise please contact us with your project idea or requirements. Advice is freely given by our engineering staff via phone or email. Recently Gippsland Water undertook a $40 million project that to deliver reticulated sewerage services to approximately 2,700 properties in the lakeside township of Loch Sport in Victoria. Ocean Controls was contracted to develop the Motorola Moscad RTU PLC programs that were used to control the two main Sewer Pump Stations at Progress Road and Snipe Street and provide monitoring and alarming information to the SCADA system at the Head Office. At Progress Rd the Moscad RTU was used to control the operation of 2 pairs of 22KW pumps which pump the waste water from Lochsport to Dutson Downs a distance of 30 kms. 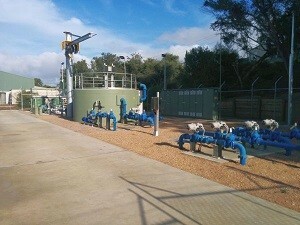 The Moscad RTU monitored the VSD's, flows, Wet Well levels and Power usage. It also controlled the deodorisation system to remove hydrogen sulphide from the wet well and a bore pump used in flushing of the system. At Snipe St the Moscad RTU was used to control the operation of two 22KW pumps which pump the waste water to Progress Rd. The Moscad RTU monitored the VSD's, Flows, Wet Well levels and Power usage. It also controlled the deodorisation system to remove hydrogen sulphide from the wet well and a bore pump used in flushing of the system. Once or twice a week the RTU operates two remote valves and a positive displacement pump to flush the waste water network around Snipe St.
A customer contacted us to say 5 natural gas flow instruments they installed only had Modbus communications and he required a 4-20mA signal from each of the instruments. The cost of retrofitting a 4-20mA card was prohibitive. We programmed 5 Delta 10SX22 PLCs to act as a Modbus Master and poll the instrument and output the inlet pressure reading as a 4-20mA signal on one of the analog outputs. The company then asked that each PLC have a Touchscreen fitted and the pressure, temperature, vibration Vx and Vz be displayed. This data was also logged to a USB memory stick and an ethernet connection on the HMI allowed a remote PC to remotely monitor all 5 units over an ethernet wireless link. We have developed the following packages which we sell. ISEE-Modbus and ISEE-Modbus TCP: PC-based HMI software with SCADA features to view, log and control Modbus slave devices from your PC. ViewPID: A control program for graphing and controlling PID controllers from a PC. Most custom projects begin with a written outline of your project which we can provide an obligation-free quote for. We are happy to help you develop your requirements into a sufficiently-detailed specification for us to quote on. We can provide fixed-price or hourly rates. Please contact us with your project idea or requirements. Advice is freely given by our engineering staff via phone or email.